Babies can enter this world in one of two ways: Pregnant women can have either a vaginal birth or a surgical delivery by Caesarean section, but the ultimate goal is to safely give birth to a healthy baby. 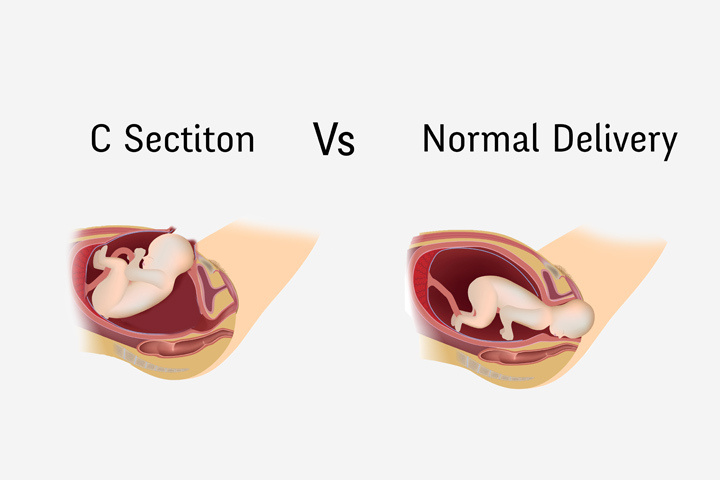 Normally, a vaginal birth is preferred to C-section as vaginal birth is a natural way of giving birth and had almost no effects. On the other hand, C-section(cesarean section) is the delivery of a baby through a surgical procedure in the mother’s abdomen and uterus. A C-section may also be necessary in certain situations, such as delivering a very large baby in a mother with a small pelvis, or if the baby is not in a heads-down position and efforts to turn the baby before a woman gives birth have been unsuccessful. Here are 11 Facts About Normal Vs C-Section Delivery, All Women Should Know ! 1. Some studies have found that women who have delivered by the vaginal method are more likely to have problems with bowel or urinary incontinence than women who have had C-sections. 2. A c-section is preferred when the baby is not in a heads-down place and can’t be turned other way round in anyway. 3. The baby sometimes grows so much that it is bigger than a woman’s pelvis. In this case, C-Section is chosen. 4. The baby has a known malformation or abnormality that would make a vaginal birth risky, such as some cases of open neural tube defects. 5. Although C-sections are generally considered safe and, in some situations life saving, they carry more risks compared with a vaginal birth. They are a major surgery and involve opening up a pregnant woman’s abdomen and removing the baby from her uterus because a vaginal birth is considered too dangerous or difficult. 6. Vaginal Birth also causes tearing of the vaginal skin, the muscles and the uterus while the fetus moves through the birth canal. 7. However, C-sections in first-time mothers often lead to repeated C-sections in future pregnancies. Hence, vaginal delivery should be preferred. 8. Studies found that after a C-Section Delivery, breastfeeding start slow, there is more pain and soreness in the mother and as this method is a surgical one, the recovery process also takes times because of the blood loss and remaking of tissues. 9. Typical length of a hospital stay for a woman following a vaginal delivery is between 24 and 48 hours: however, that for a C-section may range from a week to a month. 10. Women who undergo vaginal births avoid major surgery and its associated risks, such as severe bleeding, scarring, infections, reactions to anesthesia and more longer-lasting pain. 11. Women should be given a choice and informed about various methods of giving birth. However, giving birth vaginally feels like more of a natural experience as said by thousands of mothers.